For the first time, the United States voted Friday against an annual UN resolution condemning Israel's occupation of the Golan Heights, dropping its practice of abstaining in the vote. The non-binding resolution was adopted in a General Assembly committee by a vote of 151 to 2, with the United States and Israel the only two countries opposing the measure. Fourteen countries abstained. US Ambassador Nikki Haley called the resolution "useless" and "plainly biased against Israel," citing concerns about Iran's military role in Syria to oppose the measure. "Further, the atrocities the Syrian regime continues to commit prove its lack of fitness to govern anyone. The destructive influence of the Iranian regime inside Syria presents major threats to international security," she said in a statement on the eve of the vote. The resolution declares that the Israeli decision to occupy and annex the Golan was "null and void," and calls on Israel to rescind that decision. 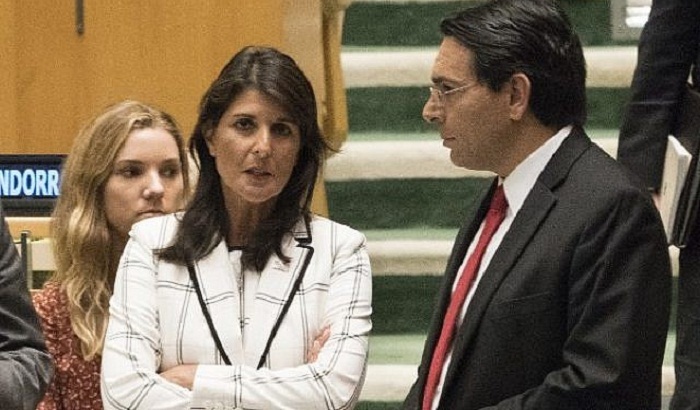 Israeli Ambassador Danny Danon applauded the US shift, which he said was "another testament to the strong cooperation between the two countries." The administration of President Donald Trump has taken a strong pro-Israeli stance, defying UN resolutions by moving the US embassy to Jerusalem and cutting aid to the UN agency for Palestinian refugees. US ambassador to Israel David Friedman told an Israeli newspaper in September that he expected the annexed Golan Heights to remain under Israeli control "forever," and mentioned the possibility of US official recognition of the Golan as Israeli territory. Ahead of the vote, US diplomat Samantha Sutton said the US position on the status of the Golan Heights had not changed, but added that the resolution was out of touch with the situation on the ground. "This resolution does nothing to address the increasing militarization of the Golan and the serious threats that confront Israel from Iran and Hezbollah's presence in the area," said Sutton. The resolution was adopted by the assembly's fourth committee on decolonization.